More than 1,600 people have signed a petition calling for the A422 between Banbury and Brackley to reopen – while the council says it is working ‘as quickly as possible’. The main road has been shut since August 7, as Northamptonshire County Council decided a bridge over Farthinghoe Stream was unsafe for traffic. Part of the frustration for motorists is that is may not be open until the end of the year with delays being caused by the need for various consents to be secured. Kate Nash, a mother from Brackley whose children go to school in Banbury, set up the petition last week in the hope of convincing the Government to step in. “I don’t see why they can shut an A road for this long and I though this bridge is going to stay closed for a year or two if we don’t make a fuss,” she said. Ms Nash believes the unofficial diversions through the villages are not appropriate with buses and lorries going down single-track roads. She cannot understand how it can take so long to repair the bridge, and thinks the council cannot afford it with the recent financial crisis. But Northamptonshire County Council denies that is the case, saying the money is available but consents are still required to work over the stream. A spokesman said: “Everything is being done to achieve this and get on site to repair and reopen this year. “The design currently being worked on is to install a weight-bearing membrane. Following a routine inspection in August, damage to the bridge had accelerated and required urgent repair works so the route was closed to traffic for safety. The main diversion route while the closure is in place is via the A43 and the M40 as the roads have to be of the same standard. 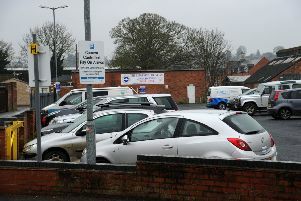 But many drivers are using the more direct routes through villages like King’s Sutton to get between Banbury and Brackley. The council spokesman said they are ‘extremely conscious’ of the impact to the public and have not taken the decision to close this route lightly. “We appreciate how important this route is to connecting village within South Northamptonshire,” he added.